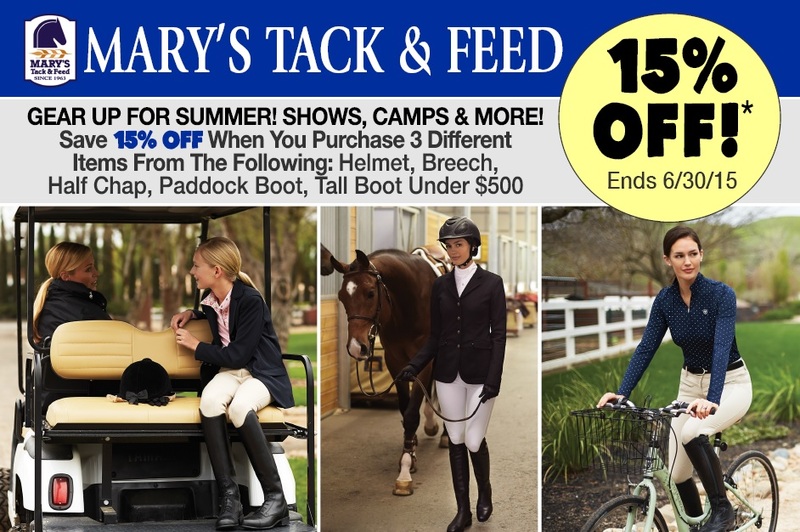 Mary’s Tack and Feed is currently offering 15% off when you purchase 3 different items from the following departments (1 from each department): Helmet, Breech, Half Chap, Paddock Boot, or Tall Boot under $500. Are you signing up your kids for horse camp? Need to replace your show apparel for summer horse shows? Are you planning on going on an excursion or vacation on horseback? Now is the time to stock up on gear for the rider! When you purchase 3 different items from helmets, breeches, half chaps, paddock boots, or tall boots (under $500) you will save 15% off on those items. How this sale works: purchase your for your horse camp eager kid breeches, paddock boots, and a helmet – receive 15% off. Purchase for your upcoming summer shows a new helmet, show breeches, and tall boots – get 15% off. Purchase for your horseback adventures a helmet, paddock boots, and half chaps – save 15%! This great offer ends June 30th, 2015, but hurry! Shop now for best selection! Visit in store, shop online or call 858-755-2015 or Toll Free 1-800-551-MARY(6279) to take advantage of Mary’s 15% off Gear up for Summer Sale!